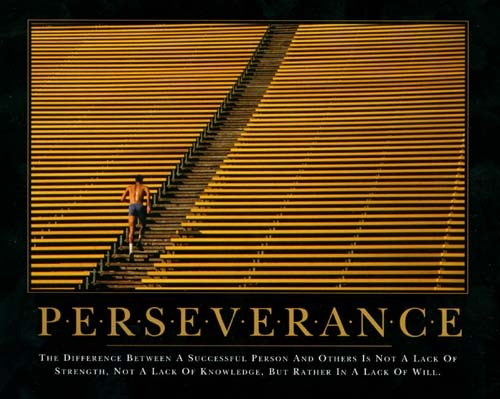 Pərsəˈvi(ə)rəns - Steadfastness in doing something despite difficulty or delay in achieving success. Sounds like the very definition of marathon training, doesn't it? Some 18 weeks, over 85 training runs, 650+ miles, bad weather, crazy schedules, fatigue and ..... well, you get the picture ...... all to prepare us for that delayed success of the finish line. 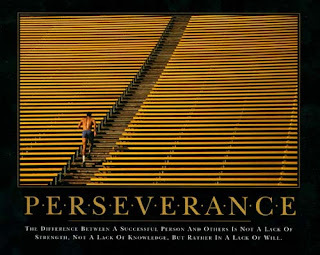 And actually, it's not just marathon training, perseverance is required of all runners, beginners or life long addicts. Now, transition from the physical act of running to the testimony of perseverance that we find in the Apostle Paul. Last week, Pastor Andrew took us through the formula for making an impact in our culture for Christ. Based on Acts 20, we saw several examples of Paul's approach to Show + Tell (click here for blog notes). In Acts 21 & 22, Paul has left Ephesus and is making his way to Jerusalem. In his excellent message, Pastor John pointed out where Paul was warned of continuing this journey. He had the option to stay, or even turn around, when faced with these certain challenges. He elected to stay the course and persevere! "..... the people there pleaded with Paul not to go up to Jerusalem. Then Paul answered, “Why are you weeping and breaking my heart? I am ready not only to be bound, but also to die in Jerusalem for the name of the Lord Jesus.” When he would not be dissuaded, we gave up ...."
"When he would not be dissuaded ...." - that's GREAT! It's one thing for others to see our drive, our passion, our perseverance when it comes to running and training, but a much greater, eternally significant matter for our character to be one of spiritual perseverance.